What does High/Low Impedance Mean? 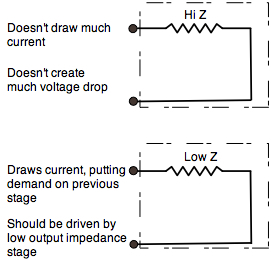 Using the voltage divide concept to understand Input and Output impedances. 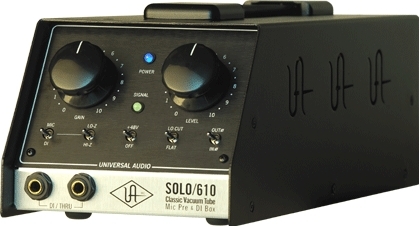 We often hear people speak about audio devices as being either high or low impedance. What does this mean? Why is it a problem when you connect a device with a high output impedance to another device that has a low input impedance? In this section, we hope to de-mystify this concept, and build a conceptual understanding that will help you in your use of audio equipment. To understand input and output impedances of audio devices, we need to first examine a simple electrical circuit knows as the age divider. We are interested in determining the voltage at point A. This can be determined easily by the following reasoning. 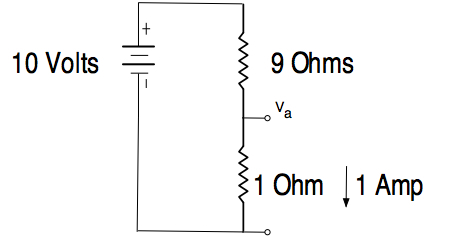 First off, since we know the total resistance, we can determine the current through the circuit by applying Ohms Law. 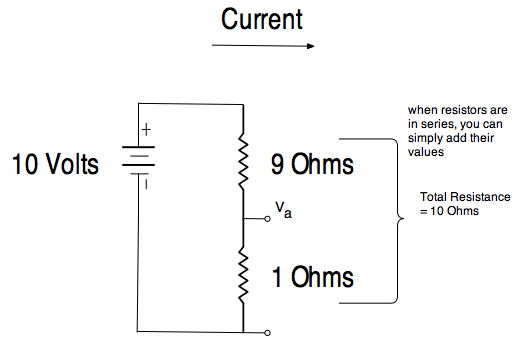 Solving for the current through the circuit, by applying Ohms law to the total resistance. Determining the voltage at point A, by using Ohms law. In this diagram, the voltage source ( the battery ) has been grouped with $9 \Omega$ resistor. It turns out that all devices can be simplified in a similar manner - specifically into a voltage source and an impedance ( in this case a resistance ) which is known as its output impedance. In this example, the $1 \Omega$ resistor is known as the electrical load, and similarly all devices with input connections can be characterized by an equivalent impedance ( in this case a simple resistance ) which is known as its input impedance. In this next example, we examine what would happen if we hooked up a device with a much higher input impedance, namely $10,000 \Omega$. There are a couple of ways to think of what would happen in this case. Summarizing we see that we get a decrease in voltage when we connect an audio device to another unit which has a low input impedance. This can be significant when the output voltage of the preceeding unit is relatively high. In order to avoid a significant loss in voltage we would like the output impedance of a unit to be as low as possible, and the input impedance of the device it is connected to, to be as high as possible. 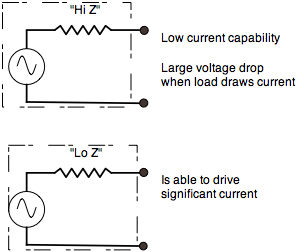 In terms of voltage and current, high-output impedance devices typically deliver low currents while low-output impedance devices are capable of delivering higher currents. 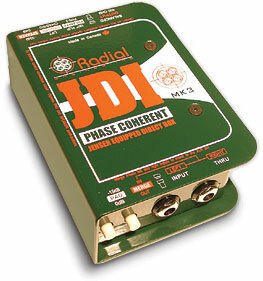 Alternatively, a device with a high-input impedance draws low currents, thus not placing much of a load or a demand on the device to which it is connected. Devices with low input impedances can draw significant currents thus can only be driven effectively by devices with low output impedances.